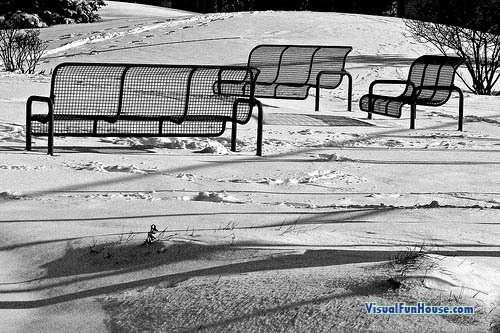 The Park Bench Optical Illusion is a very cool photo taken by lynn fagerlie. Funny enough lynn didn’t even realize the Illusion until she got home and uploaded them to her computer. Hidden aspects are the best, it always fun to discover new things once the picture is developed or in this case uploaded to the computer. The park bench illusion is a snap shot illusion but the illusion itself is all in the perspective. If you take a look at the bench on the left can you tell which way its facing? is it away? or wait its coming at you… or is it! The bench on the left is facing away from the camera.